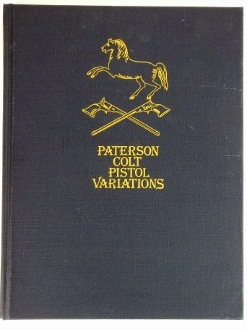 Book Details: This book serves as a historic reference and identification guide for Paterson Colt Pistol Variations. The cover shows a little wear with a few scuff marks. Overall reall nice cover. Nice black & white illustrations with some color pictures. Dark blue cloth like cover measuring 8 3/4” x 11 1/4”. Previous owners name written on page just inside cover.